Salt Lake City – Designed by two Utah-based snowboarders, the team specializes in graphic design and engineering. The carbon fiber boards and aluminum bindings of DRIFT Boards make them lighter than a two-liter soda bottle. 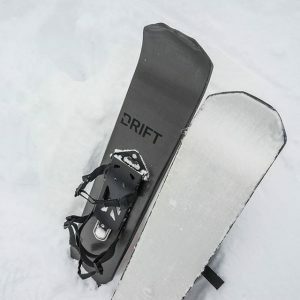 DRIFT Boards are the first of their kind to combine a snowshoe, a cross-country ski, and a splitboard to make the ultimate backcountry travel product for snowboarders. Each pair of DRIFT Boards weighs 3.75 lbs and measures 6.75″ x 35 to make them easy to take along when hitting the mountain. There are built-in skins for traction and guide to ensure users are able to grip the snow when needed and also glide on flatter surfaces. The webbing straps and folding heel cup allow for a smooth in-and-out transition of DRIFT Boards. They can be used with snowboard boots and all other soft boots. DRIFT Boards are handmade in the USA, ensuring the highest quality and performance. DRIFT Boards are perfect for breaking trail in deep snow and holding an edge on slick traverses. They fit in backcountry skin tracks and move like a cross-country ski, allowing the heel to pick up off the back of the board for optimal movement. While they are a similar idea to snowshoes, DRIFT Boards are lighter than the average snowshoe and the narrower shape makes them much easier to maneuver through almost any kind of snow. DRIFT Boards can be found exclusively on Kickstarter for $349, saving $50 off the retail price. While DRIFT Boards are available on Drift’s Kickstarter page they are also offering Drift branded decals, t-shirts, and hats. For more information, visit bit.ly/DriftKS. DRIFT is a startup out of Salt Lake City, UT, home to some of the best snow on earth. Founded in 2016, the DRIFT team came together to create a better way to travel in the backcountry. Drift boards are the brainchild of David Rupp, a composites engineer, and Nick Hansen, a graphic designer. David and Nick have extensive experience in the outdoor industry and share a love for snowboarding in fresh powder. DRIFT aims to create outdoor products for winter sports enthusiasts. For more information, visit bit.ly/DriftKS.